Do you want to create a buyer persona for your business? Smart marketers know that clearly defining your ideal customer is the key to high conversions. In this guide, we’ll share how to create a concrete buyer persona (with templates & examples). Here’s a quick overview of what we’ll cover in this guide. Feel free to use the links below to skip to a particular section. If you’ve never created a buyer persona before, you may be wondering, what is a buyer persona and why is it important for your business? A buyer persona (a.k.a. “customer avatar”) is a fictional person who represents a particular company’s ideal customer. The purpose of creating a buyer persona is to get crystal clear on the individuals who you are marketing to. Until you nail this down, you can’t really be sure that your offerings and your marketing messaging are going to be successful. That’s why the buyer persona is often based on real customers, and/or extensive research. I should also note that you may have more than one buyer persona. That’s perfectly OK! Sometimes your product or service is a good fit for several different “types” of people, so you’ll just need to create a buyer persona for each. That way, when you go to write any given blog post, email or sales page, (or even create a new product), you’ll know exactly which buyer persona(s) you are speaking to. And in turn, you’ll enjoy much higher conversion rates. OK, now that you know what a buyer persona is and why it is so important for your business, let’s dive in to how to create your own! The first thing you’ll want to do when creating a buyer persona is to do some research on your existing customers (if you have any). These people actually bought from you, so they are the most targeted people to look at. Ask your marketing and sales team to see what they can tell you about your existing customers demographics and other characteristics (see the list of questions below). However, don’t rely exclusively on your marketing and sales team to know all of this information. In most cases, you’ll need to conduct a survey to get all the information you need. The best thing you can do is to actually get on the phone (or a Skype call) with your customers and have a chat with them, one-on-one. I like to do this at least once or twice per year. If you don’t have any existing customers, then speak with your email subscribers, social media followers, or any other leads you have. Simply say that you are doing some research to better serve them, and ask if they would be available for a brief 10-15 minute call. While getting on a phone call is the best way to research your ideal customers, there is also another way to go about it: online research. This part may seem a bit creepy, but I like to choose a particular individual and track them down on all of their social media profiles, publications, and other websites. Facebook and LinkedIn are my favorite places to look for information that can help me fill out my buyer persona. As you go about your research, keep a document with links to all relevant information on that person. This way, you can come back to these links later as you are creating your customer avatar. Also, don’t just look at what’s on the surface. Try to read between the lines to figure out what makes that person “tick” (not just what they want the world to see). Now that you’ve gathered your information–both on the phone and online–you are ready to start the customer avatar exercise. This exercise is where you’ll actually write down everything that you know about your ideal customer. 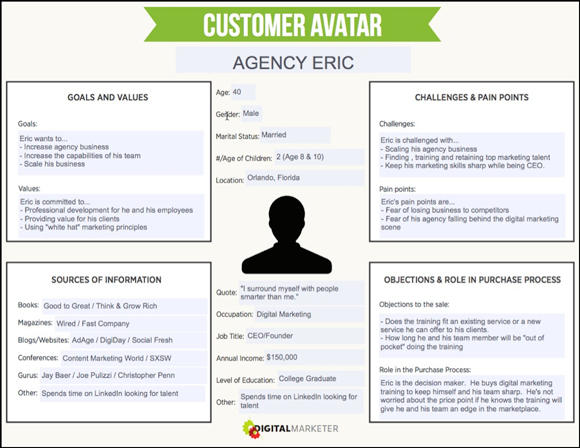 I personally like to use Digital Marketer’s Customer Avatar Worksheet (see templates below), but you could use any of the templates or tools below. The idea is to create a concrete character that anyone in your company can use to better understand your target customers. 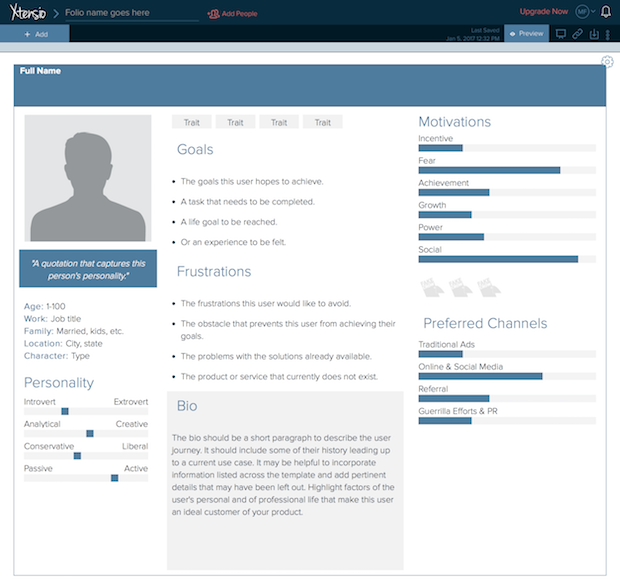 Xtensio’s User Persona Creator is a neat app that allows you to enter your buyer persona’s demographics, goals, frustrations, bio, motivations, preferred channels and brands. You can even add modules to the avatar as you see fit. Register for a free account to get started with the tool. 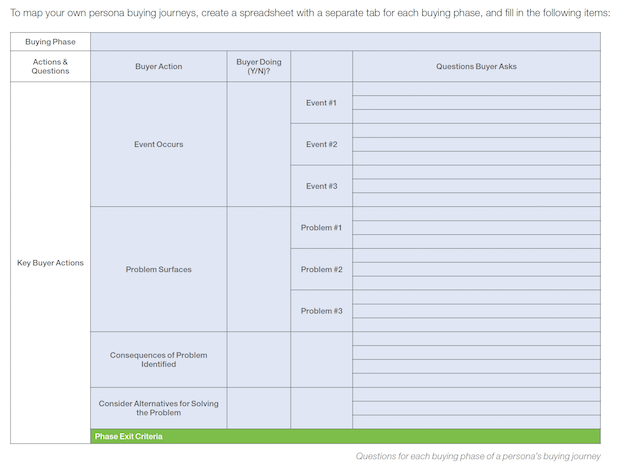 Digital Marketer’s Customer Avatar Worksheet is my preferred buyer persona template. It includes all of the important areas to nail down, in a simple PDF format that you can fill in on your computer. They’ve also included one sheet for females and one for males. 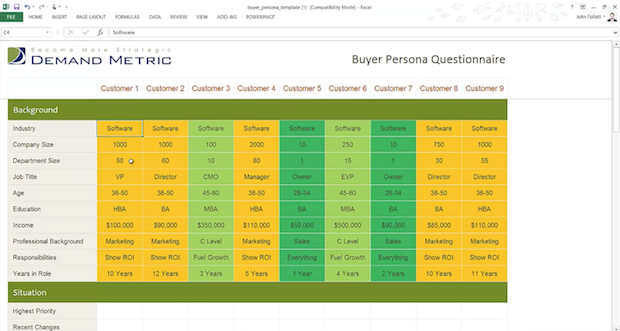 Demand Metric’s Buyer Persona Template is an Excel spreadsheet that includes multiple tabs for multiple personas. It’s a great way to view all of your target customers at a glance, with all relevant information. They’ve even included a video with helpful instructions for filling it out. 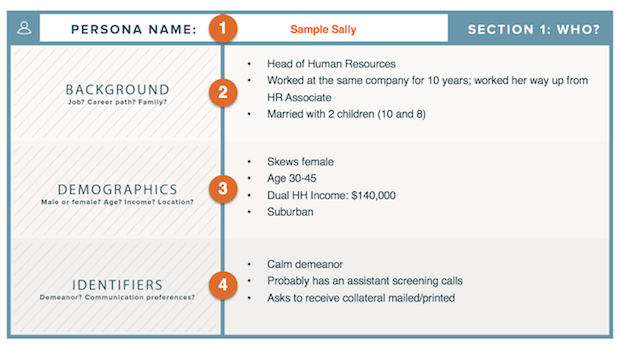 HubSpot’s Buyer Persona Template includes 4 sections for answering the important questions: who, what, why and how. 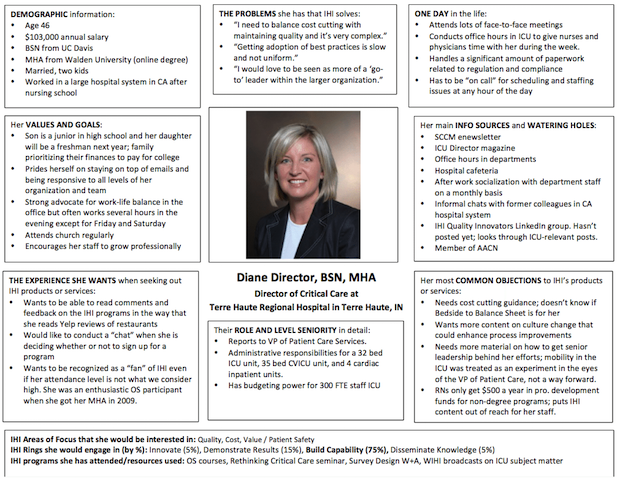 This template also includes a guide for creating buyer personas. 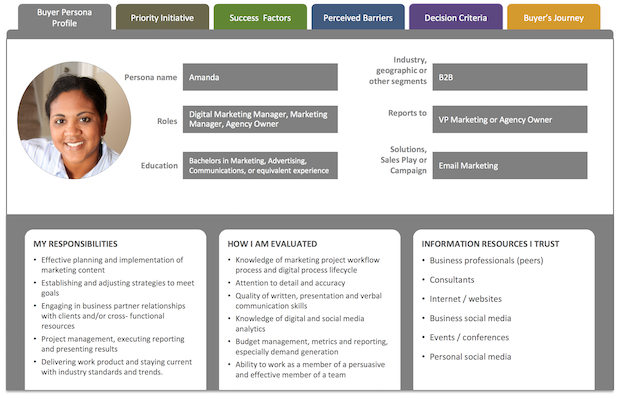 Marketo’s Marketing Persona Cheat Sheet is unique in that it includes a fill-in-the-blank map for creating your buyer persona journeys. It also includes instructions for how to create a buyer persona and journey, along with a buyer journey template. 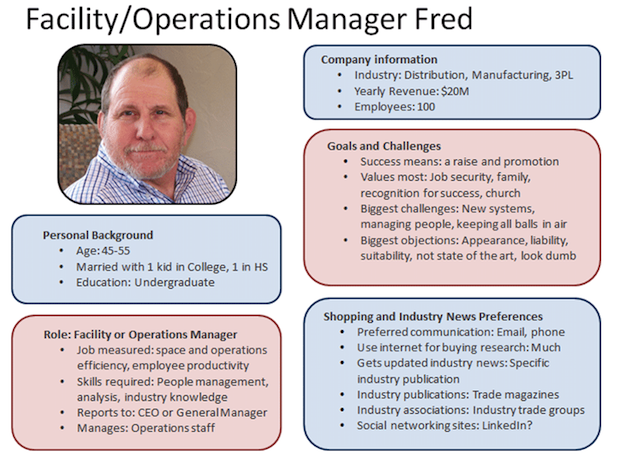 Filestage’s Buyer Persona Template is simple and elegant. Some unique features of this template are sections for a tag cloud, archetype and product adoption group. It also comes with a PowerPoint version, as well as a PDF version. 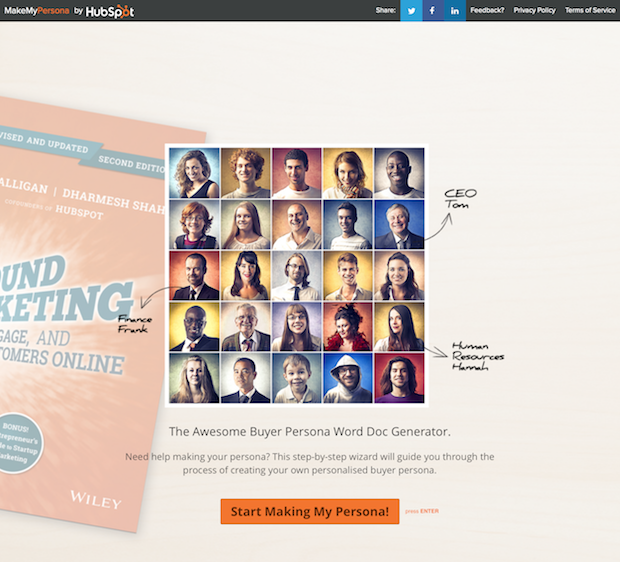 MakeMyPersona is a buyer persona generator by HubSpot. All you have to do is click on the “Start Making My Persona” button, and it will ask you a series of questions about your ideal customer. 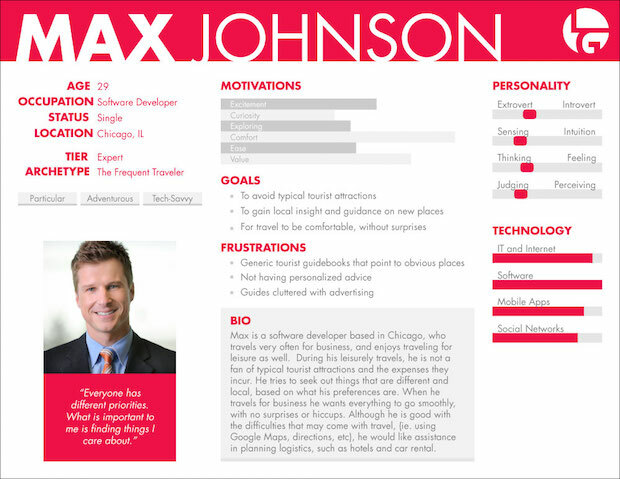 Once you’re done, they will send you a PDF complete with a headshot for your customer avatar. While the above buyer persona templates are excellent starting points, sometimes you’ll want to go more in-depth than the questions covered by any generic template. Depending on your industry and your products, there are certain “niche” buyer persona questions which are important for your business to answer. What is your racial/ethnic heritage? Was it a rural, suburban, or urban area? What kind of house did you grow up in? What did your parents (or primary caregivers) do for a living? Are your parents still married? Did your parents have a permissive or authoritarian parenting style? What are your favorite childhood memories? What were your favorite childhood activities? What was your least favorite subject? What grades did you get in school? Do you enjoy learning new things? Did you have a lot of friends, a few close friends, or no friends? Did you get in trouble at school? If so, what did you major in? Did you enjoy your college experience? What did you do after high school if you didn’t attend college? What stopped you from going to college? Are you happy about your current marital status? If so, how many and how old are they? Are they boys or girls? If you don’t have children, do you want to have children in the future? Are you likely to have children in the future? If yes, how many and what are they? What type of housing do you currently live in? Who lives in the house with you? Are you happy with your current situation, or do you wish it was different? How close are you to your extended family? Do you currently have many friends, a few friends, or no friends at all? Do you see your friends often? What is your political orientation? Are you actively involved in politics? Do you make an effort to stay fit and healthy? What type of exercise do you do? If you don’t exercise, why not? Do you care about your personal appearance? What hobbies do you currently pursue? What social groups/activities do you participate in? Do you cook at home or eat out? Are you a neat freak, or are you OK with messes? How much time do you spend at work and at home? Do you experiment with recreational substances? What do you wish was different about your weekly routine? What news sources do you read? Do you regularly go on vacations? If so, where do you go? Have you ever been backpacking? What is your current literacy level? Who do you report to? What metrics are you responsible for/how is your job measured? What are your challenges at work? How do you learn new information for your job? How do you prefer to interact with vendors? How did you arrive at your current position? Do you feel like you are compensated fairly? Do you like the work you are assigned to? Do you have plans to pursue your dream job? What work-related associations do you participate in? Are you quiet or boisterous? Are you practical or prone to flights of fancy? Do you prefer to follow the rules or challenge boundaries? Do you like to take risks or play it safe? Are you an innovator, or someone who tends to go with the flow? Are you flexible or rigid in your thought patterns? Are you spontaneous or do you prefer pre-determined plans? Are you motivated by your own achievements or by what others think of your efforts? How affected are you emotionally by other people’s judgments? What would it take for you to deem your life a success? What would make you think your life was a failure? What social media sites do you use? How do you use the internet to search for products or vendors? Could you describe a recent purchase? How do you prefer to make online payments? Are you concerned about online privacy? How adept are you at using technology? Do you tend to embrace new technologies or prefer to stick with systems you know? Are you a fluent internet user? What mobile devices do you use? What is your preferred search engine? What sites do you usually shop on? Do you use your cell phone to make purchases? Where do you go to learn about a product or service? How important is it for you to get a good deal? What indulgent or luxurious purchases do you make? How do you feel about your current spending habits? What factors drive you to make a purchase? Are you the main bread-winner in your household? Are you the financial/purchase decision-maker? What do you hope to gain from using our product? What accomplishments are you the most proud of? What is the most frustrating part of your day? What regular activities do you find stressful? What makes you feel scared? What is the fastest way for someone to make you angry? What is the least favorite part of your job? What is the worst job you can imagine? What is the worst customer service experience you’ve ever had? What purchase did you most regret? What objections do you have to our product? What factors might make you choose a competitor’s product over ours? How can we help you to solve your unique challenges? How does our product help you become your ideal self? How can we meet your needs through onboarding? What questions would you ask yourself before buying a product? What is your number one concern when deciding whether or not to make a purchase? How do you prefer to make a purchase (online, over the phone, or in person)? When making a purchase online, what is your preferred payment method? What technical and demographic information do you have about our website visitors? How are you currently marketing to our target customers? What marketing campaigns have been the most successful? What marketing campaigns have been the least successful? Which blog posts have received the most traffic/social shares/comments/etc.? What are the most frequently asked questions on the blog or from customers? Which pages on our website receive the most impressions? What types of customers do you typically meet? Why do different types of customers typically make a purchase? What reasons do customers cite for selecting us over our competitors? What are the most common objections you hear? That’s it! We’ve shown you what is a buyer persona, and how to create a buyer persona for your business. 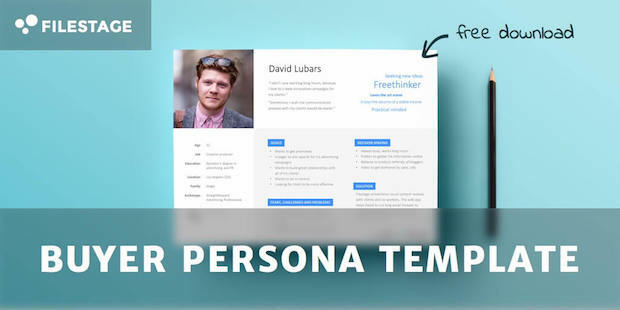 We also shared some buyer persona templates and tools, a comprehensive list of questions to ask about your target customer, and some examples of buyer personas. Now it’s your turn. Go ahead and follow the steps above to create your own buyer persona, and get crystal clear on the individuals you are serving. You may also want to check out our Definitive Guide to Email Marketing. If you enjoyed this guide, please consider following us on Facebook and Twitter for more practical tips to boost your site conversions. Great information and much appreciated! Always love OptinMonster’s emails. Every time it adds a tremendous amount of value and learning. Glad you liked it, Nik, and thanks for creating such a great template. 🙂 You might also enjoy our article on tailoring content to your buyer persona. Please follow us on Twitter or Facebook to get the heads-up on our latest posts. Thanks for this brilliant article! Full of many useful links and resources that I shall be going back to when I need them. 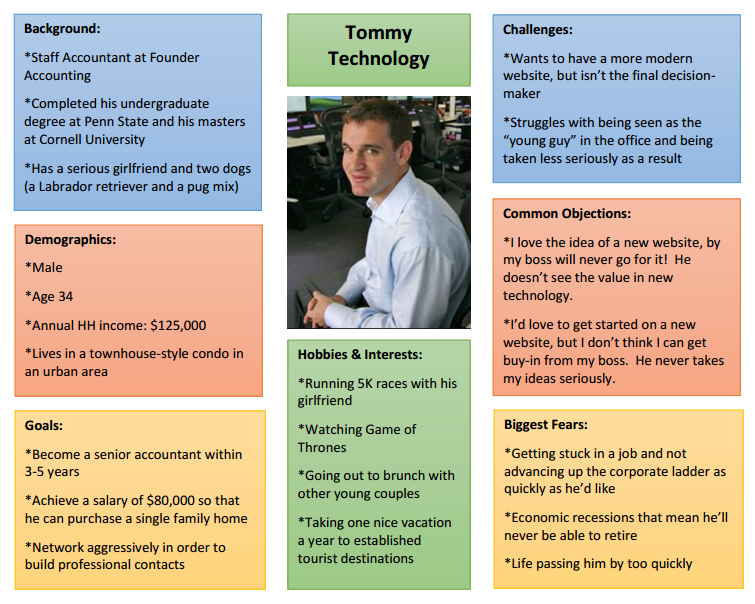 I particularly like HubSpot’s MakeMyPersona generator, which is really easy to use and creates an impressive document! Thanks, Toks. 🙂 And of course, once you have your personas, you can use that in all your marketing, for example eCommerce personalization.